TRACTION INTÉGRALE, NAVIGATION, TOIT-OUVRANT, CAMÉRA DE RECUL AVEC SONAR AVANT / ARRIÈRE ET SYSTÈME DE FREINAGE DE CIRCULATION TRANSVERSALE, MONITEUR D'ANGLES MORTS, SYSTÈME AVERTISSEMENT SORTIE DE VOIE AVEC ASSISTANCE À LA DIRECTION, SYSTÈME DE PRÉ-COLLISION AVEC ALERTE AUX PIÉTONS ET ASSISTANCE À LA DIRECTION, INTÉRIEUR CUIR SUPÉRIEUR NOIR / GARNITURE BOIS, SIÈGES AVANT ÉLECTRIQUES / CHAUFFANTS ET VENTILÉS, SIÈGE CONDUCTEUR MÉMOIRE, VENTILATION AUTOMATIQUE BI-ZONE, AUDIO LEXUS ENFORM AVEC ÉCRAN 10.3 / AM / FM / CD / USB / BLUETOOTH / CARPLAY / RADIO SATELLITE SIRIUS XM INTÉGRÉ À 10 HAUT-PARLEURS, VOLANT DE CUIR / CHAUFFANT / INCLINABLE ET TÉLESCOPIQUE ÉLECTRIQUE / CONTRÔLE AUDIO / BLUETOOTH ET RÉGULATEUR DE VITESSE À RADAR, HAYON ÉLECTRIQUE, PHARES DE ROUTES (DEL), ESSUIE GLACE ACTIVÉ PAR LA PLUIE ET ENCORE PLUS!! VERSION LUXE AVEC CARACTÉRISTIQUES INNOVATRICES TEL QUE: ADDITION DU LSS+ SUR TOUTES NOS VERSIONS, SYSTÈME AUDIO ENFORM, COMPATIBILITÉ APPLE CARPLAY, PALETTES DE CHANGEMENT DE VITESSE, NOUVEAU PHARE À TRIPLE FAISCEAU ET ENCORE PLUS!! AWD, GPS, MOONROOF, REAR BACKUP CAMERA W/ FRONT AND BACK SENSORS AND REAR CROSS BRAKING SYSTEM, BLIND SPOT MONITOR, LANE DEPARTURE ALERT W/ STEERING ASSIST,PRE-COLLISION SYSTEM W/ PEDESTRIAN ALERT AND ACTIVE STEERING ASSIST, PREMIUM LEATHER INTERIOR / WOODGRAIN TRIM, ELECTRIC / HEATED AND VENTILATED FRONT SEATS, DRIVERS MEMORY SEAT, DUAL ZONE AUTOMATIC CLIMATE CONTROL, LEXUS ENFORM AUDIO W/ 10.3 DISPLAY / AM / FM / CD / USB / BLUETOOTH / CARPLAY / INTEGRATED SATELLITE RADIO W/ 10 SPEAKERS, LEATHER / HEATED / POWER TILT AND TELESCOPIC STEERING WHEEL W/ AUDIO / BLUETOOTH AND DYNAMIC RADAR CRUISE CONTROL, POWER BACK DOOR, LED HIGH BEAM, RAIN SENSING WIPERS AND MORE!! 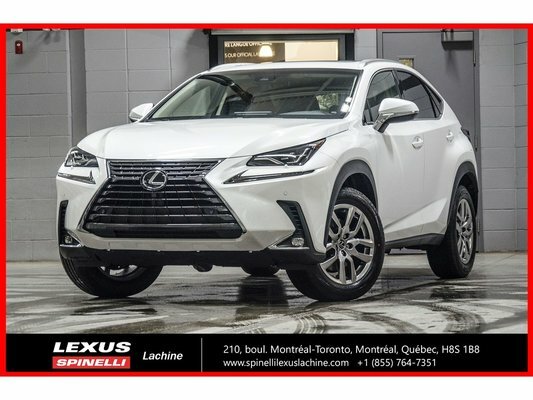 LUXURY PACKAGE W/ INNOVATIVE FEATURES SUCH AS: LSS+ ON ALL MODELS, STANDARD ENFORM AUDIO, APPLE CARPLAY COMPATIBILITY, PADDLE SHIFTER, NEW TRIPLE BEAM HEADLAMP DESIGN AND MORE.